Safety education messages without a “real-life” story of a close call, or fatality, are often ignored by farmers. The feedback from agriculture media indicates that education alone doesn’t change farmers’ safety practices. Personal stories are easier to relate to – and recall – than statistics or data summaries. They bring the message home. Personal stories also have impact. They can change the way farmers view work and influence decisions they make about taking risks. 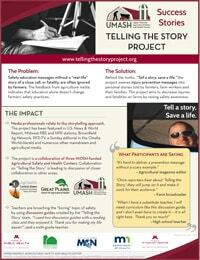 Behind the motto, “Tell a story, save a life,” the Telling the Story Project weaves injury prevention messages into personal stories told by farmers, farm workers and their families. The project aims to decrease injuries and fatalities on farms by raising safety awareness. Media professionals relate to the storytelling approach. The project has been featured in U.S. News & World Report, Midwest PBS and NPR stations, Brownfield Ag Network, RFD-TV, a Sunday editorial in the Omaha World-Herald and numerous other mainstream and agricultural media. 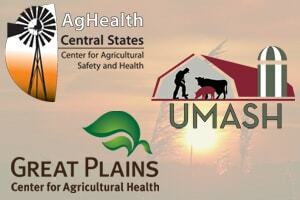 The project is a collaboration of three NIOSH-funded Agricultural Safety and Health Centers. Collaboration on “Telling the Story” is leading to discussion of closer collaboration in other areas. Teachers are broaching the “boring” topic of safety by using discussion guides created by the “Telling the Story” team. “I used two discussion guides with a reading class and they enjoyed it. Thank you for making my life easier!”, said a sixth-grade teacher.